LightStim for wrinkles** it clearly states on the box, the first LED device approved by the US Food and Drug Administration which is intended for the treatment of wrinkles on the entire face. Well when offered the chance to try it out, how could I say no? Especially when the Hubby wants to try and get rid of his Gordon Ramsey forehead (his description, not mine). I am quite lucky I am not really showing any signs of ageing, though there are one or two lines beginning to make their appearance around my eyes. The device in question is hand held and looks like a shower head, only it isn't. It uses 72 therapeutic LED lights which you hold against your skin on those areas you wish to target. LightStim emits a soothing warmth, it is totally painless and can be used to treat your forehead, crows feet, cheeks, smile lines, jawline, neck, decollete and hands. As I have mentioned, the LED lights produce warmth but it is entirely painless and the idea is that after washing and cleansing your face, apply the accompanying (if you wish) collagen peptide serum and then sit back and relax whilst using your LightStim. You are advised to use the device for around 8 weeks. Firstly taking a photo before using it and then another one after those 8 weeks to see for yourself what improvements there have been. For the best results, again you are advised to use daily, or at least 5 days of the week and each session should last around 10 minutes each time - taking into account that for each part of your face you wish to treat, you need to be holding the device against the skin for 2-3 minutes. I have just started using this device and am really looking forward to see the differences in 8 weeks time. I have downloaded the LightStim App which I use the timer on whilst using the device on my skin. Also whilst I am using it, I tend to be laid or sat in bed reading, so the reminder is really helpful and useful. LightStim for Wrinkles isn't cheap - at a cost of £250 it is one of those products which is more of an investment purchase and can be purchased from Space NK and QVC in the UK. 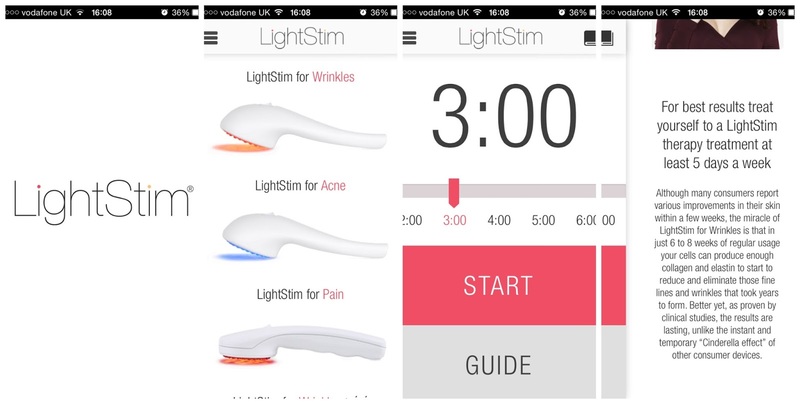 What do you think of LightStim for Wrinkles - is it something you want to try? Hi Rachel, I always wanted to use this as I heard good reviews on this - but people tell me i'm still too young to try it. I often see this on infocommercial. Anyway I hope you are well and it been aaaages since I last said hi. That looks really interesting, I would love to try that out. Can't wait to see what results you get. Normally I am very cynical about products that claim to get rid of wrinkles but I just reviewed an eye cream that genuinely did work, so maybe the science is improving. Just the thing I need to take care of my slowly expanding wrinkles. Good luck with it. Ooh its never to early to start investing in anti-wrinkle devices!! It's not something I need at the moment but I am interested in the before and after looks. I guess if you were thinking of paying for professional treatments this would work out cheaper in the long run. Wow- this is something I really need now!! I will wait for your before and after pictures first!! I actually used to be a buyer for beauty products at a large retailer and these tools definitely work. However, you must be consistent in using them for the long term results. Also, so cool there is an app with it! If it was proved to be effective I would definitely invest in this product. I look forward to seeing some before and after pictures. Looking forward to hearing about the results, at 41 I need all the help I can get! I like that you can get it for Acne too! I guess it's much cheaper and safer than trying to do something about it later. I am interested to hear what you think after using it a while. £250 is way out of my price range - I guess my wrinkles are staying! Sounds like a great product. But the price is a bit too much for me. woah! if it works then its definitely worth the money. Sounds very interesting - never heard of this product before but if it helps keep wrinkles at bay then I'm all for it!